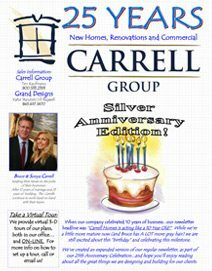 The Carrell Group has released its Spring 2012 Newsletter, and largest edition yet! In recognition of our 25th Anniversary year in business, we’ve published a larger newsletter with many current updates, including: Current Price per Sf discussion, International Home Show Visit, New Floor Plans, Entering Waterbridge and Carolina Forest as a Preferred Builder, Renovations underway, and more. We write and publish this as an informational tool for our customers, so please read it thoroughly and let us know how we can help you. When our company celebrated 10 years of business…our newsletter headline was “Carrell Homes is acting like a 10 Year Old!” While we’re a little more mature now (and Bruce has A LOT more gray hair) we are still excited about this “birthday” and celebrating this milestone. We’ve created an expanded version of our regular newsletter, as part of our 25th Anniversary Celebration…and hope you’ll enjoy reading about all the great things we are designing and building for our clients.